Illustration courtesy of Federal Premium Ammunition. Federal has released the most innovative muzzleloading projectile in decades and it works. For years, rightly or wrongly, muzzleloading hunters have been grousing about spit-patching their barrels, so they can get their next load down the chute and carped about sabots that load too tight. As a result, the poor-performing Powerbelt bullets have become popular. Flyweight pistol bullets act like varmint bullets when they impact bone at high velocities, an increasing problem as muzzleloading velocities have increased. As a rule of thumb, it you want accuracy, projectiles need to load tightly. Conicals should engrave and so should sabots. An undersized bullet that rattles going down your barrel when loaded is prone to rattling and yawing on the way out. It isn't likely to remain concentric with the bore. It is a further problem in a few backward states that don't allow sabots, apparently not comprehending that the patch in "patch and ball" is a sabot and does the same thing, taking up space in the bore. Some states (California, for example) have inflicted senseless lead bullet bans in an effort to further harass hunters and firearm owners. 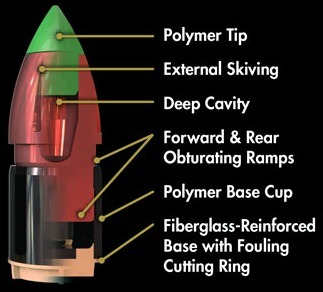 The new Federal 270 grain Trophy Copper has no discarding sabot, for the sealing mechanism is integral with the bullet. Upon firing, the base of the bullet assembly is driven forward, over the bullet itself, expanding the black polymer ring that takes up space in the bore and seals at the same time. It is a sabotless design, a .50 caliber, bore-size bullet and it loads with just a couple of fingers on the ramrod, practically falling down the bore. The base of the bullet keeps it right where it was seated. As the bullet itself is made from heat-treated copper alloy, it promises essentially 100% weight retention and is approved for use where lead bullets are not. Though the packaging says to use it in a 1:28 rate of twist barrel for best results, that makes little sense. I tested it in a Remington Model 700 Ultimate Muzzleloader with a 1:26 rate of twist and will be trying it in several rifles in the future, including 1:24 rate of twist Savages. Although being .50 caliber with fairly light for caliber weight prevents it from having a high ballistic coefficient, it is slightly better than a .452 diameter, 250 grain Hornady XTP. If you remove the base and polymer ring from this bullet assembly, you have essentially a 250 grain bullet. Note the 275 grain Trophy Copper slug used in Federal's 20 gauge saboted round has a published B.C. of .171. As a shooting B.C. varies quite a bit in concert with ambient conditions, using a static B.C. of .167 should be close enough for starting purposes. Federal has done a good job here. If you're using Blackhorn 209 with this new Federal bullet, you'll never lick a patch again. You can leave all your cotton patches, swabbing solvents, Bore Butter, short starters, and other assorted oddities of inconvenience at home.